At a personal level, I wanted to learn more about selling because I’ve always found it so difficult myself. I considered it a necessary evil and wanted to discover a more positive way to think about it. The challenges in selling never seemed to me the techniques or the process, but rather the deeper psychological and personal challenges: resilience, optimism, the balance between service to the client and profit for oneself. None of this was addressed during my MBA program, and sales is absent from most MBA curriculums, which is an extraordinary omission. Then finally, I’m fascinated by the most human aspects of business, those moments when two people look each other in the eye and decided whether or not to trust each other, whether to buy or sell. Sales, as one great salesman told me, is the greatest laboratory there is for studying human nature. After writing this book, I agree. What role does sales play in our culture? It’s everywhere, not just in commerce. We sell ourselves to each other for jobs and friendships. We sell our children on the importance of going to school. We are all selling all the time, so it’s important we get comfortable with selling well. This does not mean that capitalism has permeated ever aspect of our culture – that’s a whole other discussion – but rather that the back and forth inherent in selling, the importance of self-knowledge and the ability to persuade are vital to realizing our purpose, whatever that might be. People have been bombarded with books and information on how to succeed or get ahead at their job – what is different about The Art of the Sale? I hope this book helps whoever reads it to sell better, but it’s not a self-help book. It’s an examination of selling, the personalities who succeed at it and the psychological challenges it presents. I hope it helps people reflect on who they are and how they can make the very best of their talents through selling. But this is a very personal process. I hope that somewhere amidst the range of characters, stories and reflections in my book, each reader will find a few that deeply resonate with them. There have been a number of business leaders who’ve written books about the art of doing what they do, from Lee Iacocca to Jack Welch to Donald Trump, did you research these people and what do you think of them? Yes, I’ve read their books and they’re all fascinating. But these are extreme personalities with extreme careers. They can inspire, but they’re difficult models to follow. I give the example of Ted Turner in my book, an incredible salesman capable of bringing people along in pursuit of his visions. He has a wild reputation as someone who says the unsayable and behaves outrageously. Which he does occasionally. But most of the time, he’s a really diligent businessman. The study of these larger than life characters can help us expand our notions of what’s possible in business and overcome certain limiting fears. But they’re not templates, and shouldn’t be treated as such. A world full of Iacocca’s, Welches and Trumps would be unbearable. Their stories can give us motivation and inspiration, but they’re not a rigidly prescribed recipe. You describe your book as the “Dale Carnegie for the 21st Century” – can you elaborate? Dale Carnegie wrote about the habits and practices required to make friends and influence people. What he proposes is pure common sense. Why he’s still read is because, as the CEO of the Dale Carnegie company told me, “common sense isn’t common practice.” I think a lot of the secrets to selling are in fact common sense, but they get buried by our enthusiasm for quasi-scientific techniques and answers. I hope that my book returns selling to a more intimate, personal level, which is where the hardest sales challenges must be solved. If you can wrestle the basics into place and develop the right mindset to sell, then it will spill over into the rest of your life with enormously positive consequences. Were there some universal qualities you found in great sales people? Resilience, persistence and optimism are the fundamental traits of good salespeople. They have high degrees of emotional intelligence and empathy, but also sufficient ego to deal with endless rejection and to push through a sale against the odds. They are great readers of people and tend to be highly creative in achieving their goals. Many are wonderful story-tellers. They really like people. I’ve yet to meet a great salesperson who wasn’t great company. These traits and qualities can come in all kinds of packages. Is a good salesman “born” and “not made”? Definitely made, not born. But a lot of the development of traits and habits goes on very early in life. Traits such as resilience, persistence and empathy are formed very young when our brains are more plastic. They can be developed later on, but the significant work occurs during childhood and adolescence. Hence the often heard sales adage, hire for attitude, train for skill. Developing great sales traits later in life is rather like learning a foreign language. You can do it when you’re an adult, but it’s a lot easier when you’re a child. Which is why I think selling should be part of every child’s life. This isn’t to turn them into mini Donald Trumps. But to give them the skills to turn their talents and passions into a living later in life. Why is the idea of the “salesman” so often derided? A couple of reasons. The first is that there are so many bad salespeople out there, who treat customers poorly and leave them feeling robbed: sub-prime mortgage brokers; used car dealers; snooty fashion store assistants. Salespeople take our money, so even when they’re good, it’s hard not to feel a mild sense of resentment, of having been “had”. Another reason is the treatment of sales in popular culture. Writers and artists who want to write about business gravitate to selling because it’s the most visible aspect of business to those not in business. And it’s this amazing human drama, involving truth and lies, persuasion and vulnerability. So we get these grim visions of Death of a Salesman and Glengarry Glen Ross, which are basically tragedies with salesmen at their heart. But it doesn’t need to be like this – and it shouldn’t be. Salespeople issue the invoices in any company. They bring in the money. Everyone else spends it. Perhaps people resent salespeople. What do you say to people who say the “salesman” culture brought us Enron, Worldcom and the mortgage crisis? I don’t think a “salesman” culture need be considered a bad thing. What brought low Enron and Worldcom were crooks not salesmen. The sales problem in the mortgage crisis was the lack of real selling. The traditional relationship between lender and borrower was broken in the rush to sell subprime mortgages. Great salespeople develop good customer relationships and sell over the long haul. It’s quite wrong to think that to be a good salesperson you have to be this outgoing moron with no ethical values. The best salespeople are terrifically smart and decent and can be either outgoing or more restrained. This whole “introverts are best” meme I find has quickly turned from interesting to patronizing. Is President Obama a good salesman? Is a good salesman what we need in the White House over the next 4 years? Obama’s a brilliant salesman – as you must be to be elected President. Convincing the American people to put you in the White House is one of the greatest sales challenges. His particular gift is in making the great speech when it counts. He’s not an effortless glad-hander the way Bill Clinton was. But cometh the moment, cometh the man. In 2008, he created an attractive vision and mobilized a terrific campaign organization behind his ideas and personality to win against the odds. That was a great selling feat. Once in office, selling is one of the President’s main jobs, as it is for any chief executive. Presidents need to be able to sell their policies to get them implemented. They also need to exude confidence in difficult times. No one wants to see a shrinking President. We crave one who deals ably with the realities of the present while providing a confident view of the future. So, yes, selling is a vital skill for any President, but particularly when the country needs rallying. Steve Jobs – tell me what you think? Purely as a salesman, Jobs had a remarkable gift for demonstrating the usefulness of his products and for persuading people of the rightness of his vision. No CEO has been able to captivate an audience or speak directly to his customers the way Jobs did. He developed an almost messianic following and used religious language to describe his products. They were “transformative” and “miraculous”. His ads encouraged people to “think different” and yet the mobs of people in Apple stores suggest consumerist conformity. He embodied many of the contradictions and complexities of 21st century capitalism, a Zen materialist, a vegan bully, a spiritual capitalist. But who doesn’t love his stuff? Tell me about salesmanship in other places, such as Asia, or the Middle East? Can any of these other places teach us something new? The basics of selling and the kinds of people who do it well are remarkably similar wherever you go. But cultural and social factors have a huge effect on the work. In Japan, most salespeople are compensated in the same way as others in the company. There isn’t a whole separate, commission-based structure to motivate them. This leads to less aggressive behavior and more of a focus on service and less on pure sales numbers. In the Moroccan souk, dozens of stores all next to each other selling identical products, creates a very aggressive sales culture. The only differentiator is the aggression of the salesman. This has nothing to with Moroccans, but everything to do with the business environment. By stripping out what’s cultural and what’s economic, we can develop a much clearer view of what matters in selling. Finished your book and as a 30 year successful vet of selling in corporate B2B world, “Thank you!”. This should be required reading for anyone who manages a sales force. It is a insightful scholarly treatise on sales people, what makes them tick, why they do it and how the great ones succeed told in wonderful personal level stories. Many sales people will get a lot of affirmation from reading it and many sales managers who never sold will get an equivalent HBS education about selling. Well done, sir!! Thanks so much Michael. I really appreciate it – especially from one who really knows selling. I just read your Article Today in Economic Times and will be reading your book soon. I wanted to complement you on your new book about sales. I read many of them every year and your book a refreshing change from the “how to” books that flood the market. I’ve been in sales for over 20 years and I’ve recommended your book to my peers and to my wife with hope that she’ll develop a better understanding about what I do each day. Thanks so much Jeff. I very much appreciate it – and I hope your wife likes the book too! This is a must book for everyone, since we are all selling. Now you have written this book, sales people will have no excuses for not making their numbers. Thanks. 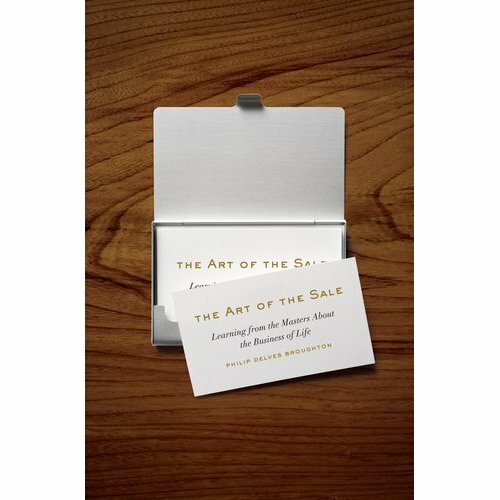 I have just listened to the The Art of the Sale and have thoroughly enjoyed it. I am not a salesman by title but agree that sales is a vital part of nearly every relationship. I believe that many of the insights you share can be applied to success generally and I appreciate your humor and your engaging stories. Thanks, Philip, for bringing thoughtful, thorough writing to this interesting subject. Thanks as ever, Joel. I hope you enjoy the rest of the book as your road trip unfolds. I listened to a podcast on iTunes from The Invisible…titled “The Art of the Sale” and I liked what I heard. I’ll be reading your book and continuing to read up on your website. Thanks for your hard work and for sharing it with the public. thanks casey. hope you enjoy the book. deeply thought in my business and human realtonships so much appreciated. Has THE ART OF THE SALE been published in Korea? If not could you provide information on the contact person for foreign rights? Please disregard my previous post. I just found out that the book has already been published in Korea. I wish you every success! Philip… Wow! Before I sell you you something I would like to be a little humble. I bought your book ‘life’s a pitch’ while browsing around on holiday the past December in Ballito S.A.
As with books I buy (never ever been a addicted, nor/even a occasional reader) your book has been sitting next to my bedside lamp together with Jeremy Clarkson’s ‘how hard can it be’ (or something similar) for most of this year. Its also the first ‘sales’ related book I have even bought. But for some odd reason (as a wolf in sheep clothes) /salesman. ‘In a good way’ I decided to start reading your book. To be honest, I’m only at page 32. But as honey to bears, I enjoy it and find myself re-reading some sentences. As a guy, late 20’s. Brought up in a retail family and having worked from a young age selling oranges outside my dads sore I can relate to what your writing about. Sales have always been my game. I love it. Its way more fierce than championship rugby, football or any other sport out there. No qualification, degree or seminars can prepare you. Only raw talent, experience and patience! …plus the odd luck here and there. Proud to say that it has lead to a great-ish (never satisfied) lifestyle. #humble …thus far! Its very true that one can’t honestly be told how to be a salesman. Sort of a knights of the round table thing. Someone can be oblivious to their surroundings, customers or conditions. Basically… sell ice in the Sahara! Why waist time trying to sell it to Eskimos in the first place! …or in fact plain naive to think people believe you when you don’t know the product yourself! Now here is my request, I’d like for you to sign my book. Please! Condition is that I’d first like to finish reading it. Afterwards I’ll post it (detail needed) and hopefully get it back in one piece! Thanks so much for this Stefan. Hope the book holds your interest! And of course I’d be delighted to sign one for you. Great! I’ll keep you posted!